If you have a Roth IRA, you most likely have a grasp of how important it is to save for retirement effectively and just how difficult and uncertain that can be. The current global economy has caused more investors to look for a more stable and safe place to store their money. Many of those looking to diversify and protect their retirement assets have turned to gold; however, investing in gold is a tricky process. We are here to help you learn more and make the best decision for your financial future. Below is some basic information on how to safely invest in gold through a Roth IRA. A Roth IRA is a tax-advantaged individual retirement account that has a few key differences from their precursor: traditional IRA accounts. Whereas traditional IRAs have tax-free contributions and tax-deferred growth, Roth IRA distributions are tax-free and contributions are made with after-tax dollars. You will not be able to deduct contributions to your Roth IRA on your tax return, although those Roth distributions are not taxable when you retire. If you have a Roth IRA, you can continue to contribute after you reach 70 years of age. You also do not have to take withdrawals, which is required for a traditional IRA at a certain age. Roth IRA's get their name from Senator William Roth, although they were initially called an “IRA Plus”, and were introduced through the Taxpayer Relief Act of 1997. Like traditional IRAs (and unlike 401(k) plans), Roth IRAs are not sponsored through an employer but are rather available to wage earners independent of where they work. There is a maximum income restriction for Roths, however, that is not shared by traditional IRAs. As of 2014, only individuals earning less than $129,000 or couples earning less than $191,000 are eligible to make Roth contributions. Roth IRAs do have fairly low contribution limits (relative to other retirement accounts). For 2014, those under age 50 can only contribute $5,500 annually to a Roth, while those over age 50 can add $1,000 to that in a “catch-up provision.” Like other qualified plans, there is a 10% penalty for withdrawals made too early and a 6% penalty for all income contributed in excess of the annual limit. Investment choices for both Roth and traditional IRAs tend to be much greater than for employer sponsored accounts, although the IRA custodian can still limit what types of assets can be selected. Standard Roth IRAs may not invest money in physical assets like real estate or precious metals bullion. Roth IRA funds can be rolled over or transferred between financial institutions without incurring tax penalties, although rollovers are limited to one per 365 days. You can also use existing Roth IRA money to fund a self-directed IRA. There are penalties for taking distributions in cash prior to retirement age. Additionally, if you are going to attempt a rollover, it is highly recommended to elect to perform a direct rollover instead of an indirect rollover. Indirect rollovers have withholding requirements and run the risk of incurring early distribution penalties. IRA-to-IRA transfers are the most common method of establishing self-directed IRAs with exiting qualified funds. A new account is established with an IRS approved IRA custodian who, with your consent, requests the transfer of IRA assets from your existing Roth IRA. The custodian will then be able to accept the money and invest the assets according to your instructions. Here is a table to compare different retirement accounts with tax-advantages. Since several different types of retirement accounts feature “Roth options” (Roth technically refers to the tax treatment, not the account type), Roth IRAs will have the same benefits and limitations as traditional IRAs for the purposes of this table. "Maybe" indicates that gold investment options are at the discretion of the plan provider. For example, ceratin 401(k) plans offer gold mutual funds, while others do not. In short, this means that you cannot invest in physical gold bullion (or any other approved investment metal) through a standard Roth IRA. 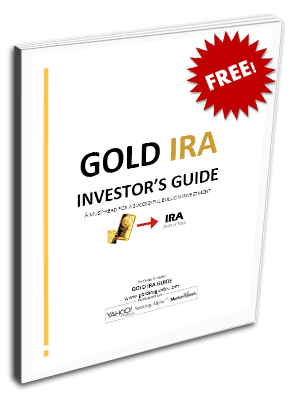 The simplest way to invest in gold through your IRA is to purchase stocks in gold mining companies or to purchase a mutual fund that includes mining company stocks. This strategy is referred to as buying “paper gold.” There are also gold ETFs (GLD) and mining ETFs which provide indirect access to gold investing. Our visitors often ask us about which companies we recommend for Precious Metals IRA rollovers and bullion purchases. Since we are an independent website, and none of us work with or have any shares of any gold IRA company, we are able to conduct impartial reviews of more than 70 companies. These reviews are based on existing customer feedback and ratings from authority review bureaus such as the Better Business Bureau (BBB), the Business Consumer Alliance (BCA), and TrustLink.